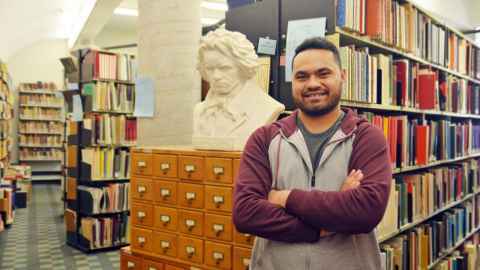 The Bachelor of Music (Classical Performance - Voice) has led to exciting performance opportunities for Manase Latu, who is now undertaking his Honours year. "I had joined my school choir in Year 11 and my conductor saw a lot of potential in me. I auditioned for the University of Auckland Chamber Choir, and was involved in that for two years before I started at the School of Music. "The transition from school to university is a big step, as it’s all on you; you have to motivate yourself, no one is there telling you what to do. But it is also really good. I get to sing every day and listen to the other students, which is really amazing. My vocal teacher focuses mainly on technique, and our vocal coach helps us with the phrasing and language in each piece. You form good relationships with your teachers, they become your friend. "I’ve had lots of exciting performance opportunities. I have been involved with Graduation Gala, Opera Scenes and I also won the Graham Allen Musical Theatre Prize. That was a great opportunity to learn a different genre – it’s completely different from classical voice. They focus on the character and storytelling, which is a good skill to have as a classical singer.